We went to Grandma and Grandpa Humphries house for the traditional dying and decorating of Easter Eggs on Saturday at 1:00. Grandma made enough eggs for each child to decorate 8 eggs. Keven was there with all his kids when we arrived and Brandon showed up with his girls not long after we arrived. Each year Grandma finds new and fun ways to decorate the eggs. In previous years there have been stickers, shrink wrap, tie dye kits, and special paints. This year when we walked in there were zip-lock bags of rice on the kitchen counter and a can of shaving cream. Shiree, Breanne, and Michael were already there helping get everything setup. 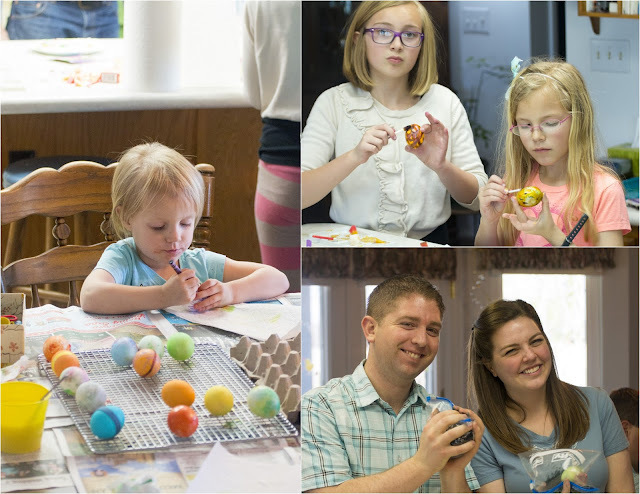 Some of the kids sat down at the table and started to draw and color on their eggs when Shiree started spraying the shaving cream into a glass pie dish. She then added drops of various colors of food coloring. Once done she took a toothpick and swirled and marbled the colors together. Be this time all the kids were interested and gathered around. Graham got to roll an egg in the food colored shaving cream mixture first and set it to the side to sit for 10 minutes. While Graham was 'coloring' his egg Shiree made a new batch and Carson was first to roll an egg in it, Emilia used the same color batch. After the elapsed time had passed, each child wiped off the shaving cream leaving behind a uniquely colored tie dye looking egg. Breanne and Michael prepared the rice bags which were to be used to make 'speckled' eggs. This was achieved by adding a lot of food coloring to the rice and getting it mixed in well. An egg was placed into the zip-lock back and then air was blown in to create a space for the egg to move. The person dying the egg would shake the bag and the rice would color the egg making lots of little speckles on the egg. They made red, green, orange, and purple bags. 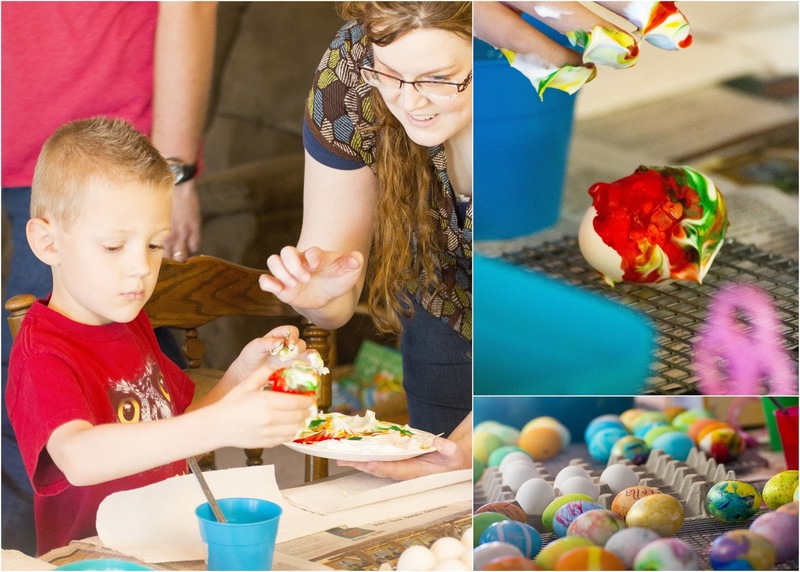 I'm sure each child tried to make at least one shaving cream egg and one rice egg.